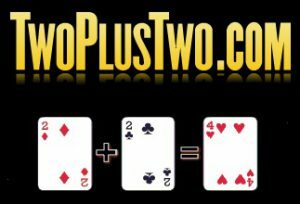 One of the biggest poker forums online is TwoPlusTwo. There are over twenty million posts on TwoPlusTwo so for new visitors to the forum it can be a bit daunting. But rest assured you will almost certainly find the information you’re looking for. David Sklansky started the TwoPlusTwo poker forum and it has increased steadily in popularity. David Sklansky is a well known and respected author who has written poker books such as The Theory of Poker which we have reviewed for you in our books section. As well as the forum TwoPlusTwo has its own publishing company that has brought out highly recommended books written by such authors as Dan Mason and Dan Harrington. The TwoPlusTwo poker forum is a place where you can go and discuss poker with some of their 200,000 other members. At TwoPlusTwo strategy is often discussed as well as all kinds of gossip and news from the poker world and generally anything the members feel like talking about. PokerStars also presents TwoPlusTwo’s ‘2+2 pokercast’ (pod cast) where they talk about what’s going on in the world of online poker and live poker. You can listen to the TwoPlusTwo pokercast anywhere and with different poker guests every week it can provide some much needed entertainment while you’re playing those long poker sessions.